Iʼd like to start off this blog series with the lighter side of my percussion arsenal, so this post will focus on one of my favorite little instruments, the Kalimba. 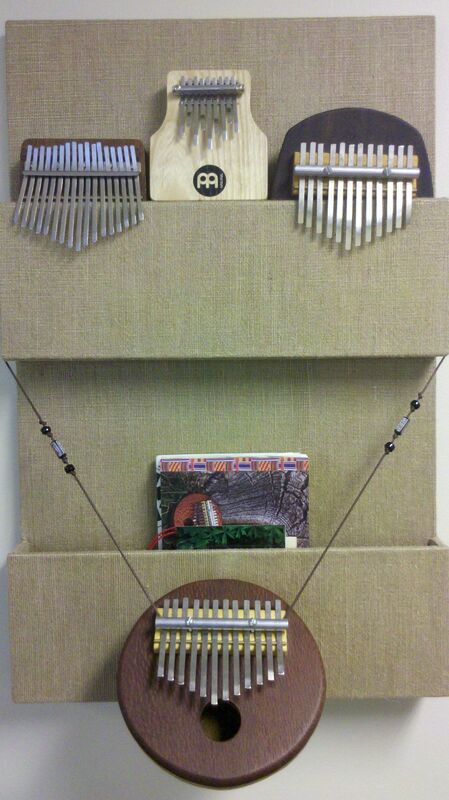 Iʼve been playing kalimba for about five years now and I own four of them, each different in some way. The kalimba is classified as a “lamellophone” (a type of idiophone) – raised metal notes (tines) are attached to a piece of wood or a gourd, and vary in pitch by the length of the tines. Itʼs played by plucking downwards on the tines with your thumbs and in some cases other fingers. I’ve also been using three other main techniques in my playing – they just come naturally when I pick it up, and then I developed them further from there. – Covers greater distances across the range of the instrument without having to strain your thumbs to work twice as fast. -Allows for wider intervals like 5ths and 7ths to be played with one hand, leaving your other hand free to fill in the rest of a chord or polyrhythm. -Opens up new possibilities with the instrument as far as arpeggios and faster playing, although Joe Zawinul’s track “Zanza II” with Paco Sery on kalimba hurts my thumbs just to listen to, haha: http://www.youtube.com/watch?v=LKL3tPuxM_w(he’s only thumbing it tho!). -This is a thumbs-only technique, where you play one note by sliding off of that note to then pluck the next highest note adjacent to it (on a standard diatonically-tuned kalimba, the interval will be a third). -I often use this technique to play neighboring notes together or in a rapid succession. I find this takes less thumb movement than plucking one tine and then lifting it back up to pluck the tine right next to it (one sideways motion rather than two up & down’s). -The way you naturally hold and play the kalimba leaves your middle, ring, and pinky fingers available to help your palms hold the instrument while your thumbs play it. But since it’s already resting comfortably in your palms, try using your middle, ring, and pinky fingers to hit the bottom of the kalimba. -This could be used for time keeping, setting up a groove to base the rest of the piece on, or even part of the overall groove/melody. -Because its an idiophone, you’ll hear the tines vibrating as well as get a nice percussive slap from the bottom of the instrument. …So by utilizing the percussive qualities of a melodic instrument you’re basically unstoppable now, especially with a live-loop pedal or layering within your recording software. This entry was posted in Blog and tagged blog, kalimba, techniques, thumb piano. Jeff, that was informative and the kind of musical information I rarely see. Keep this up and you’re going to have a lot of followers if you don’t already. Thank you very much. Really awesome post by one of my favorite percussionists!!!! Thanks for checking out this post & my other videos! Means a lot 🙂 More on the way soon. What kind of mic and micing placement/techniques did you use to record those soundcloud clips at the end of the post? it sounds great! 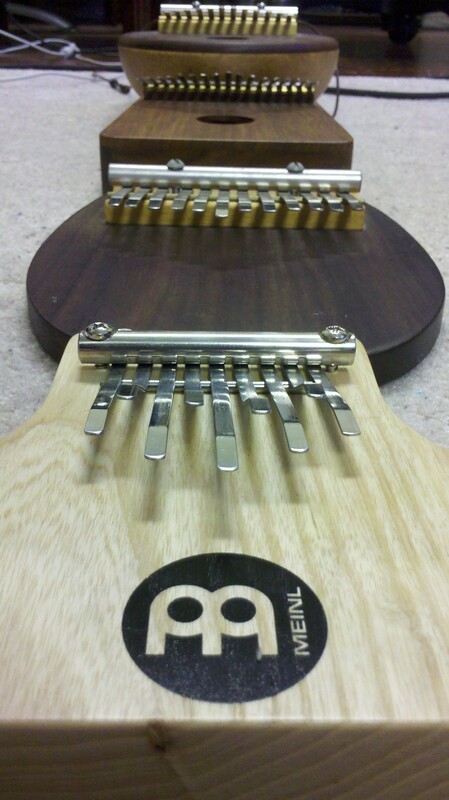 Also, how would you compare the gourd vs solid board Catania Kalimbas? How would you say they differ in sound? Any comments on the other two kalimbas pictured? Hey thanks John! Those two soundcloud clips were recorded with one Samson C03U mic – it’s a large diaphragm condenser USB mic. I’ve since been working with AKG C214’s, which I think give an even more clear and full representation of the instrument. The mic was about eight inches to a foot over top of the tines. I prefer to record with the solid board rather than the gourd kalimbas because of the consistency with the tone. 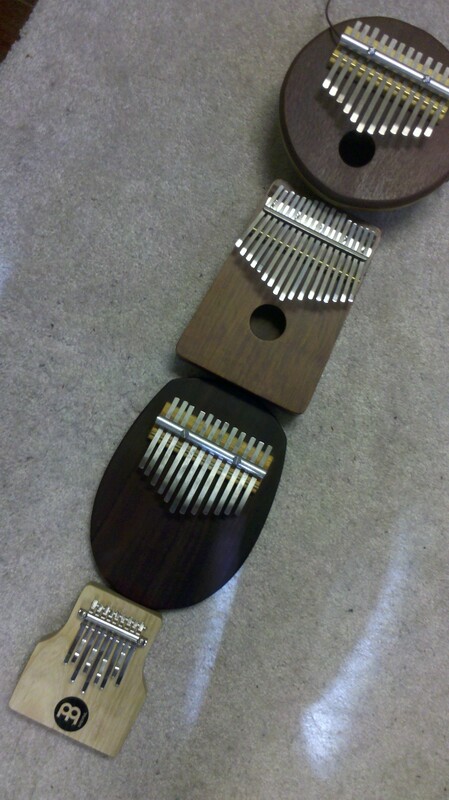 The other two kalimbas pictured are a Meinl 9-note, and a 17-note that I got from Mid-East.com. Both have a very thin tone, so I’ll be sticking with the Catania kalimbas for awhile. Thanks! Hey it seems that you know a lot about the Kalimba I bought a 10 key one and I can’t for the life of me find a website containing the information I need. For example what key is what? I just need to know so I can find some online sheet music to play or whatever. I like throwing in my own jam sometimes but that kinda gets boring. So anyway thanks for your help. Thanks Aliya! Check out http://www.kalimbamagic.com – it’s a great resource for this! I’ll have some more kalimba videos coming soon from my new album in 2017. Stay tuned!